A new benchmark study on the condition of culled Canadian dairy cows at auction provides a disturbing glimpse into the suffering of these animals. In order to produce milk for human consumption, dairy cows are kept almost continuously pregnant through artificial insemination. Within hours after giving birth, dairy producers forcibly separate mothers from their calves to return the cows to the milking line. Because of selective breeding, today’s cows produce unnaturally large quantities of milk which put their bodies into metabolic distress, forcing them to deplete their own body reserves just to continue producing milk. A study conducted by a University of Guelph research team over 16 weeks last May through August examined the condition of 4,460 culled dairy cows at three livestock auctions in Ontario. 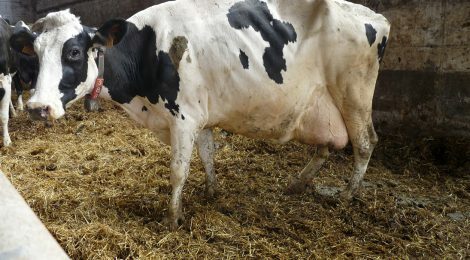 Culled cows are animals who have been pulled from their herd to be sold to slaughter for various reasons but the most common include failure to become pregnant and “low” milk production. Canada’s dairy industry has a high cull rate, with 30-40% of herds culled each year. Only 50% of Canadian dairy cows make it past their fourth pregnancy. These animals, although often suffering from lameness and emaciation, are loaded onto trailers and taken to auction houses across Canada which, depending on the farm’s location, can take up to five days. After the animals are sold, they are shipped to slaughterhouses throughout the country and into the United States. The University of Guelph researchers rated the cows on four traits: gait (how well they walked), hock injuries (defined as lacerations or swellings larger than one inch), body condition (how fat or thin they were) and tail docking (whether or not their tails had been amputated). The researchers found that almost 73% of the animals had an abnormal gait ranging from difficulty tracking to a severe limp. More than 27% of the cows had a significant injury to at least one of their hocks, and 40% had a body condition of two or less (indicating that they were thin to emaciated). Although tail docking has been banned in the industry’s Code of Practice since 2009, the researchers found that more than 12 per cent of the cows had their tails amputated. The researchers estimated that cows with compromised gaits and low body scores sold for $32 and $116 respectively less than unaffected animals, perhaps hoping to appeal to the financial interests of dairy producers. But in an industry where such animals have their own sale category (D3), the study is unlikely to affect change. It does however give the general public a sense of just how little dairy producers care about the animals they say they love.